With the acquisition of approximately 3 acres, along Highway 41, just North of El Camino Real and adjoining the new Atascadero Library, the non-profit Atascadero Historical Society will be undertaking an exciting new effort to develop this property into the Atascadero Colony Heritage Center.The ultimate purpose of the Colony Heritage Center will be to preserve the unique history of E.G. Lewis and the early residents of the Atascadero Colony, who were instrumental in building this first master planned community in California, designed to accommodate the automobile and founded in the name of the American Woman’s Republic (pre-suffrage organization), into the town that we enjoy today.The location of this project is at the periphery of the Historic District of Atascadero which currently has two buildings on the National Historic Register and is on the original site of the colony's tent city. 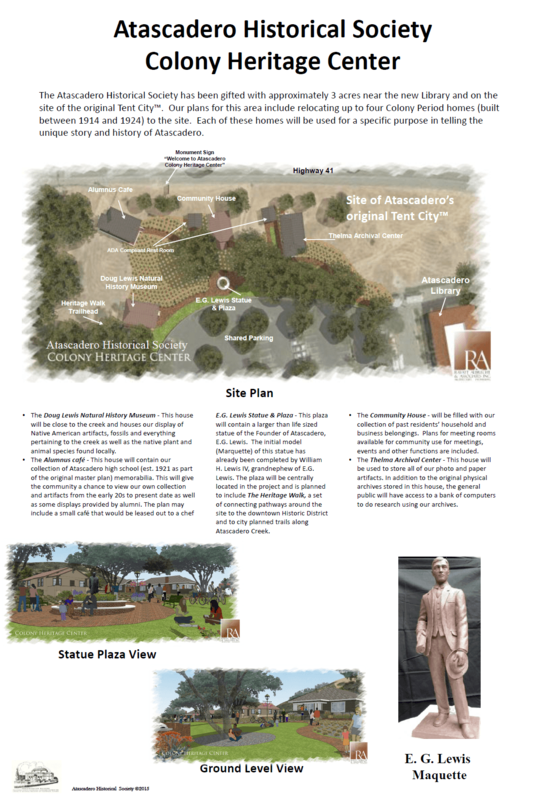 In addition to further preserving and promoting our unique history this area will be used to educate the public on the progression from the inception of the Colony (largest subdivision map filed in San Luis Obispo county) to the present day as well as the natural history.Environmental planning was a prominent factor in the original plan of this area.To accomplish these exciting new goals, the Atascadero Historical Society will be relocating four Colony homes, of which three are already pledged to this site.Our fundraising efforts to accomplish this are already underway and we are in the process of applying for grants and developing other fund raising approaches to meet our goals.